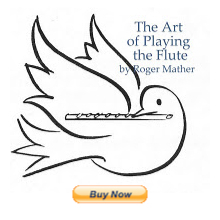 I'm in the market for a new flute, and I have only used a C foot flute before. Recently I tried several flutes with a B foot and found them much harder to play. I guess it would be a matter of getting used to it? 2. The open-holed keys make it tricky, at first, for the new user to keep the open-holes covered completely when reaching for the B-foot. I advise that if you've never played open-hole that you plug the holes when testing new flutes. Scroll down when you arrive at the above link and look under B-foot as an option. I find the B-foot ever more useful, with each passing year. requires that I use low B. I really find it useful for flute duo repertoire as well as solo repertoire.